Substandard housing affects almost two billion people worldwide. Wood, often the American building material of choice for housing, isn’t always a global resource in developing nations. Even when wood sources are abundant, as in the areas surrounding the Amazon rainforest, its utilization can be fraught with environmental issues. Its use in construction is also potentially affected by water, fire, mold and rot. Wood isn’t always a local resource either, as in the Navajo Nation of the Southwest. Shipping it from places such as Washington State comes with its own set of problems. “I want to develop the next generation of the two-by-four that’s not wood, but acts like wood — it can be connected with screws and be used to build trusses — and would not contribute to cutting down forests,” says Barzin Mobasher, a professor of civil and environmental engineering in the Ira A. Fulton Schools of Engineering at Arizona State University. Mobasher has spent more than 30 years researching composite concrete materials. He is developing fiber- and textile-reinforced concrete that is strong in compression like traditional concrete but has the added capability to be strong in tension as well as flexible — a material more suitable for a wider range of infrastructure projects. This concrete has the added ductility, or the ability to absorb energy, to withstand earthquakes and other stresses that would topple other structures thanks to tiny fibers or sheets of textile. Mobasher says houses can be made out of 90 percent composite concrete that is structurally sound and energy efficient. These composite materials can be made into modular pieces using local materials and manufacturing plants near where materials would be used. The problems of poor housing in Brazil’s favelas (slums) could be remedied with a small-scale concrete manufacturing plant that uses sisal or coconut-fiber-reinforced concrete segments, Mobasher says. 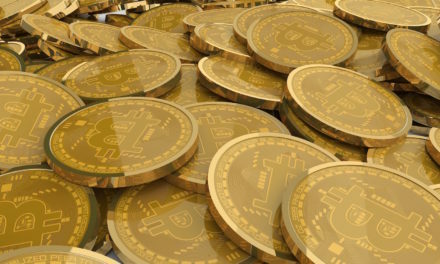 This in turn could build up the agriculture-based economy by having fibers supplied from local sources and local workers could manufacture it. In other places, integration of this technology with 3D printing could revolutionize how construction materials are made. Before Mobasher’s dream can become a reality, a lot of other work needs to be done to go from idea to building code. Construction is a slow-moving and challenging industry to work in due to the critical need to prevent failures — but failure is what drives Mobasher’s research. His interest in finding a better way for people to build infrastructure comes from his childhood when he watched his grandfather build and rebuild terraces on a mountainside in northern Iran. Every winter, snow and rain would lead to the terrace structure’s collapse, but his grandfather wouldn’t give up. He’d try different procedures and find a better design that would last longer. This also sparked Mobasher’s motivation to understand how materials fail and an unfailing persistence in accomplishing his own goal to design better materials. 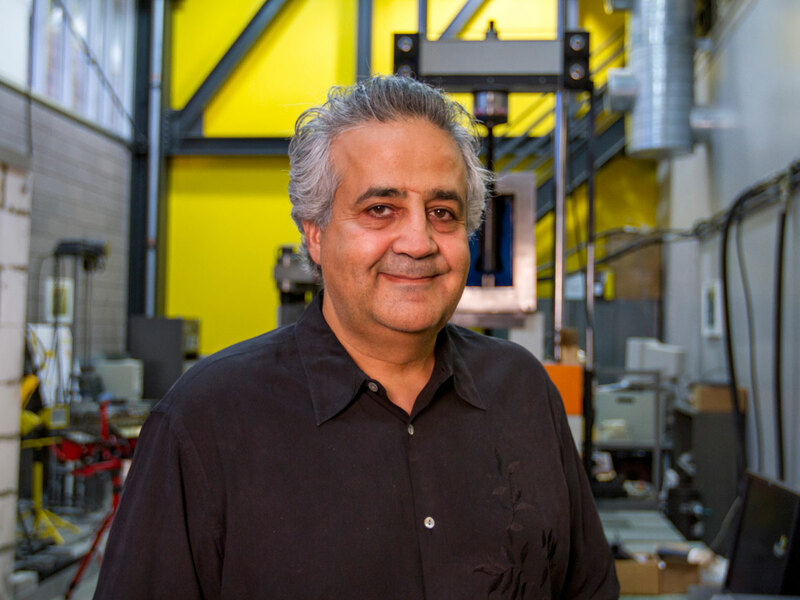 When he arrived at ASU in 1991 as an assistant professor, no one in Arizona was publishing in the areas fiber- and textile-reinforced concrete, so he charted a course for this new area of materials research. Since then, he has been developing and testing composite materials — and learning what makes them fail. The work Mobasher and his students are doing in his lab documents how the materials work and what their strengths, weaknesses and limits are. Understanding how they fail means failures can be prevented from happening when they’re put into use. Mobasher uses the measurements from the testing to develop a core set of tools to document how materials behave under different circumstances. Mobasher doesn’t limit his efforts to his lab at ASU. He also works with the American Concrete Institute (ACI), an organization responsible for writing building codes for infrastructure ranging from skyscrapers to sidewalks. The ACI’s technical committees define various codes related to concrete material use. 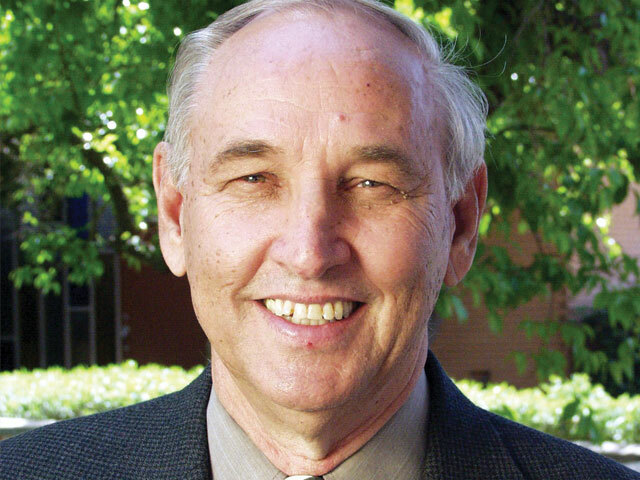 Mobasher chairs the Fiber-Reinforced Concrete Committee — a position he’s held for six years — and is also a member ACI’s Fracture Mechanics Committee and Thin Section Products Committee. As a committee chair, it’s Mobasher’s job to get new technologies put into use by compiling research, figuring out how to reach a consensus among the various members of the committee, and converting it into international reports that can become building codes — not an easy feat to accomplish. Builders use 10 billion tons of concrete per year around the world — that’s more than one ton of concrete per person — and it’s not the most effective concrete out there. The industry tends to stick with decades-old, tried-and-true materials and methods rather than switching to newer and better materials because failure is not an option in critical infrastructure. “Infrastructure is made three or four times as strong as it needs to be, and tools and models belong in an era of 40 to 50 years ago,” Mobasher says. “I want to show that we don’t have to do things the way they’ve always been done. While it’s understandable to want to avoid failure in the case of a high-rise apartment, for example, which could result in the loss of life, more isn’t always better. Instead of using a larger volume of concrete to achieve better strength, the new technologies of fiber- and textile-reinforced concretes can add that strength and added flexibility while taking up 10 times less space in volume. The efficiency of these materials has big economic and sustainability benefits. When less volume is taken up by concrete support columns, that area can be used as more rentable space. Less material means construction is quicker so disruptions — which can add up to billions of dollars in cost — can be much shorter. And 10 billion tons of concrete per year comes with a hefty carbon footprint; using less concrete that can be made of materials that last 100 years in corrosive environments means a lower carbon footprint, and thus creates more sustainable infrastructure. 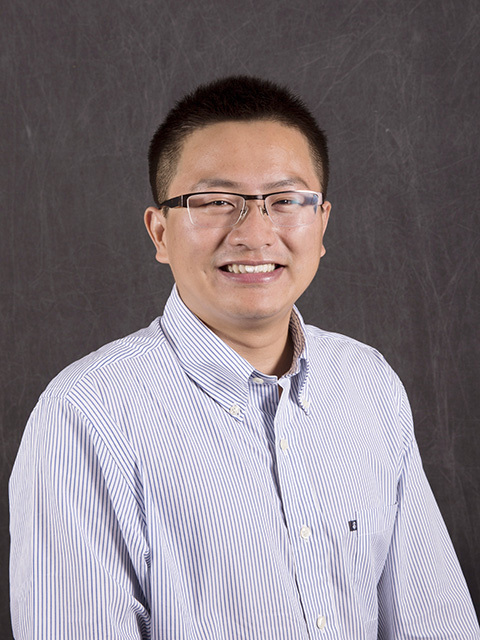 He plans to continue to expand his efforts outside the lab with more outreach efforts, setting up collaborative efforts with groups like the Global Institute of Sustainability at ASU and focusing on marketing to get more people involved, interested and using these materials in real construction projects. 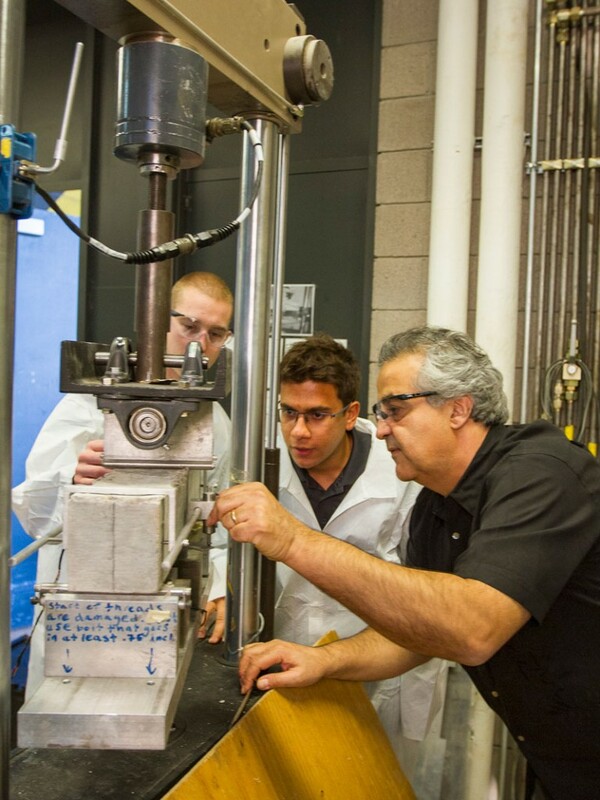 Mobasher’s work to take the field of composite concrete materials from its origins to where it is now — with its own textbooks, conferences, doctoral student theses and international reports — has not gone unnoticed. The ACI gave him its Delmar L. Bloem Distinguished Service Award at the ACI Spring 2016 Concrete Convention and Exposition in Milwaukee, Wisconsin. The award recognizes his work as committee chair in publishing three international reports that detail new design procedures he has developed through his materials research at ASU. The award is a great honor, but, above all, Mobasher hopes this will put the spotlight on sustainability and social justice issues about which he has been trying to raise awareness.